Bristol lost a teenager on Monday: Junaid Nazir age 16, killed on Fishponds Road -in front of his own house. A taxi driver was arrested on suspicion of causing death by dangerous driving, then released on bail. We don't know any other details. This was an awful thing to happen, an awful thing to see. Junaid's friends and family were there -all of them utterly devastated. He left to go to school at Filton College, and instead of coming home after another day at school, he never came back. All his dreams are gone, all that is left are memories. Every time his family leave the house, they are going to pass the place where this child -their son, their brother, their cousin - died. It was really heartbreaking to be here, I tried really hard to get a photo of the flower and not all the friends and family, -as that wasn't right. They were very welcoming, but it's hard to cover this. No schoolkids should be placing flowers to mourn the needless death of one of their friends. Afterwards, I went down Fishponds Road -never fun- then turned into Roygate Lane, then onto the railway path. Suddenly I'd gone from the friends and family mourning the death of a sixteen year old to the late summer peace and pleasantness of an almost Dutch walking and cycling route into the city. Yet what point is it in having such a lovely facility if you can't even get across a road 300 metres away alive? The whole Bristol Traffic team extends our condolences to the family and friends -it will take a long time for everyone to come to terms with this, and -based on personal experience- nobody will ever really get over it. You can never forget. We'd also like to hint to Evening Post that when they put up articles on tragic events such as Junaid's death, that either they disable comments or they monitor them so all four regular mad commenters don't just repeat their own prejudices -again, and again, and again. This is not the place for them. Our normal service will be resumed in a few days. In the meantime, there is a growing monument in Fishponds to a failure of the entire "road safety" industry. Consider visiting it. Bristol is a University City. In fact we have two of them. Bristol is a Universities City! So it's great to welcome back our important student population at this time of year. Of course, to achieve a place at any University you need hard work, intelligence and determination. And probably parents with the same qualities, but we'll let that debate simmer in the main-stream press. Here we see what could be intelligent students arriving (or possibly retuning), helped out by their intelligent parents (we refer to the cars, not the residents of Clifton navigating a route between them). 1. In Bristol pavement parking is the norm. 2. In Bristol parking on Zig-Zags is the norm. Even within spitting distance of a local Police Station, and for ages (check the exif time flags of the photos if you like - I managed to eat Tiger Prawns and consume a pint between clicks). The synchronised hazard warning lights are a neat trick, too. We welcome this fresh influx of intelligencia to our flock, and encourage them to use our cycle lanes for parking, our pavements for parking, and our Downs for parking. Remember, these students are the makers and shakers of the future - we ignore them at our peril. Thank goodness they didn't turn up here with bicycles. Here it provides it for the car RV10LZF apparently associated with Western Power Distribution -whose vans are parked off-camera to the right of the photo below. Everyone is apparently working on some electricity substation issues behind the MoD site. 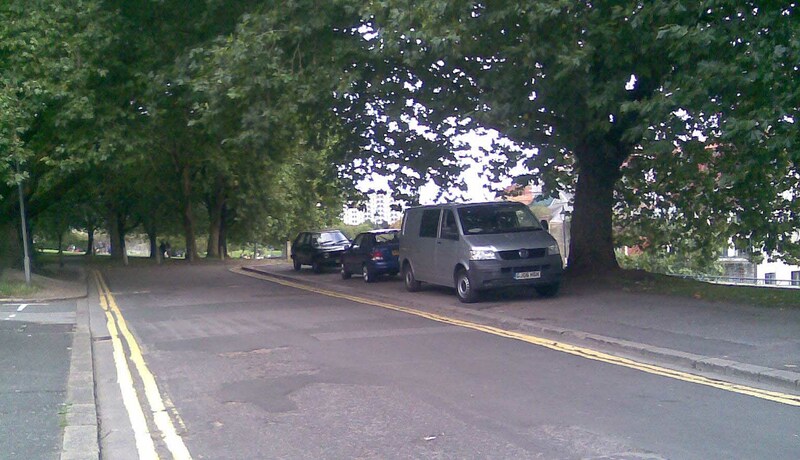 Parking over a bike/pedestrian path like this is not just about getting your car off the road, or away from the double yellows, it's about making a statement. It says I am important, you are not. Which is why we are very worried about some worrying emails we are are being forwarded from the MOD-land. Very worried indeed. More another day. Today though, we, the motorist, are in charge. First we give them their bike lanes, their pavements, to get them out the way, then we use them too. Lovely. dichohecho points us at this secret parking space hidden behind Sainsbury's on Whiteladies Road, which is also handy for that fine beveraging factility, the Alma Tavern. This will let you combine a swift pint or two in the beer garden with some Saturday shopping, without having to deal with the shopping centre's own car park, or the now-paid-for railway parking area. Parking spaces are at a premium in central Bristol. Even for tax dodging cyclists (ho-ho: serves them right for living in a 'Cycling City'). Notice the problem here? Yep, two bikes chained together due to lack of parking facilities. Poor souls. So it's nice to see tax-payer funded facilities being made use of by honest traders, instead of freeloading, benefit scrounging anarchists trying to park their 'vehicles'. Phone 9211942 for further information. We are great fans of the delivery van YA55VDY. It does an invaluable service -bringing short lifespan dairy products to the little shops in the city, helping them resist the overwhelming giants of (Tesco, Asda, Sainsburys). What we also like is the fact that we have never, ever, seen it park legally. Some people may think this is a policy decision by the driver, but we think its a direct consequence of those corner shops being on corners, on popular roads (with bike lanes and double yellow lines), and on routes that pedestrians use. The driver has no choice! Today we see how YA55VDY has been forced to park in the middle of Picton Street. Not on a pavement, not on double yellow lines. Not inconveniencing pedestrians, and by reducing through traffic, making Montpelier a nicer part of the city to live in. Narrow pavements are a real problem for drivers. Dangerous even. After all, we never know when a pedestrian may accidentally step off one. Or worse still, a cyclist might find it too narrow to ride on and have to use our roads. Luckily, T759PDA shows us the solution. If it's narrow, park on it. That way, if we hit a pushchair in the road it'll be the pedestrian's fault, not ours. Pedestrians. We know they are unimportant... but they can be dangerous. It's 16:15 on a weekday and there are bicycles here on Gloucester Road. Look you can see one waiting to walk over the pedestrian crossing, and another going to the bike lane. Two pedestrians are stopping to talk just past the car parked over the dropped kerb. Nobody, walking or cycling, is wearing a helmet. Further in towards town, again, two more cyclists, helmetless. They may be entering a bus/bike lane which is valid from 16:00 onwards, but that is no excuse. All the cars heading in to town are forced to use that bus lane to get past the turning Porsche blocking their lane. Even further in, you can see a number of vehicles parked here, fifteen minutes into the operating hours of this, a showcase bus lane. These cyclists using it do not have helmets and do not have insurance. If any of them were to hit a car parked in the bus lane, who would pay for the damage? We aren't quite sure why the police car up on the downs near the suspension bridge is in NYPD colours, but as CF05DFD is ensuring that no subversives dare to ignore the no cycling signs and ride on the paths here, so we support it. It's not enough to learn how to drive, you need to know the lifestyle -how to sprint round the city, which signs to ignore, where best to buy some discounted vodka. 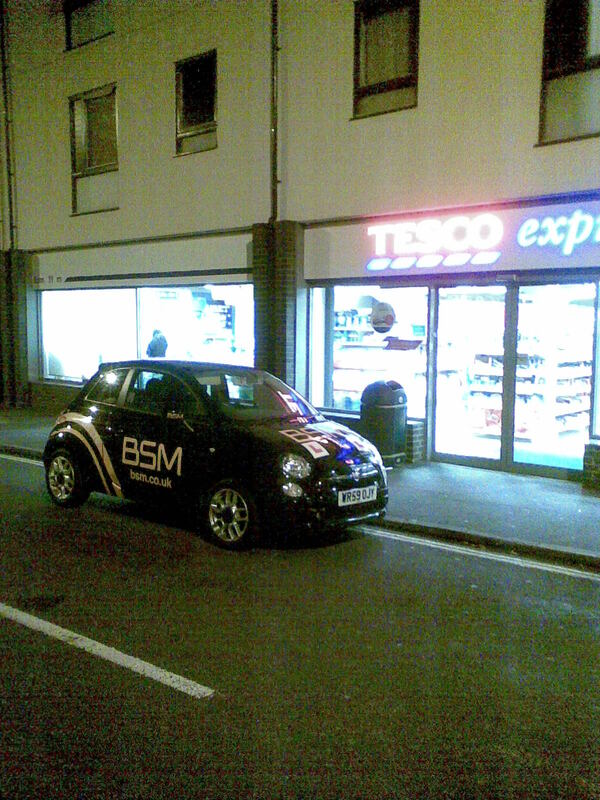 This is why we are please to get a photo from cyclista, showing the Bristol School of Motoring car WR59OJY on the double yellow lines outside the Tesco Express on Bedminster North Street. Some people are surprised that Tesco Expresses -which target passing motorists- are always on main roads with double yellow lines outside. Those people miss the point. Those double yellow lines ensure short-stay parking for passing customers. They put the shops on main roads as that is where the passing customers are. Returning to the car, look how perfectly it is aligned with the pavement, the wheels perfectly straight. That is skilled parking! We went back to Cotham Hill to see if the bike racks had been taken away, or whether we, the citizens of the city, were forced to discourage walking or cycling ourselves. A van with the Del Monte man hat was out this morning, but the camera was playing up, so no photo. What we do have is Monday's van, AG07DVK. Together with VF55GYX and another van with the Del-Monte hat in it, it ensures the uphill bike lane is unusable every weekday morning, and even pedestrians have a hard time getting down here. What you can't appreciate from these photos is the van is parked just up on the rise of the east-facing hill, so all cars coming up the hill will be forced to swerve into the oncoming bicycle lane precisely when the sun is directly in their eyes. This ensures that when they run over a cyclist they can say "The sun was in my eyes", so downgrading the event to an accident. We like it. Congratulations, then, to Fredwood Forestry, for their contribution to our city. Another weekday evening, and again, another cyclist endangering the paintwork of this important vehicle P334OWP parked on the newly-reopened Picton Square 4x4 parking area. Round the corner, we see two unusual things. First, a space in Picton Street big enough for a small car. Behind it, up on the lamppost, a 20 mph sign. Not so good. Cotham Hill is one of the front line roads in the war on motorists. An important route on the weekday school run for parents, it also tries to make bicyclists and pedestrians feel welcome. Hence the conflict. Some people are trying to stop this, and here we must praise VF55GYX, who has parked on the uphill bike lane/dotted yellow lines three days in the past week between 08:00 and 08:30. That shows dedication to discouraging cyclists not just cycling up the hill -where it is much harder to get round them, but also heading downhill, as now they need to worry about important motor vehicles swerving into their lane. Together, this may make these people realise they are are not welcome here. 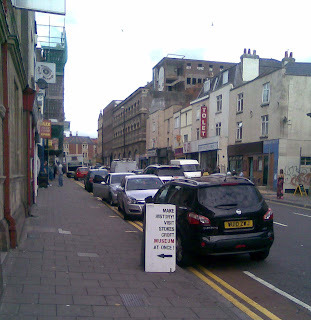 This why were are pleased to see these signs warning that the bike parking at the bottom of Cotham Hill is being removed. Here you can see the signs on the bike stands which are forcing the white van WP55NNM to park on double yellow lines, rather than this lovely buildout. Looking the other way, you can see how this popular shopping street with 1h parking suffers from a lack of parking opportunities, but note that we will have to have the bollards removed to in order for shoppers cars to use the buildout, rather than the double yellow lines, which WN07WWE is forced to do. Question is, if the bollards and the bike stands get removed, where do the signs trying to attract passing motorist traffic go? If Cabot Circus super car-park is a bit full, you can always opt for Castle Park any Saturday afternoon. Hide it under any nearby tree and your vehicle will become invisible. Stokes Croft World record attempt? The very street names "Horsefair" and "Haymarket" remind us how at one time our ancestors, the city's gentry, went about their business on horseback, generously helping the city's economy by providing jobs for your ancestors, the city's poor, grooming the horses and cleaning the streets after them. It's still the case today, as we motorists create useful employment in a range of workplaces from car-washes to hospitals. But the respect has gone. Even the city council will only allow tax-dodging cyclists and pedestrians the freedom to turn from Haymarket into the Horsefair. forcing any cyclists to dismount as a demonstration of respect. (photos and lovely text by "anonymous"). In yesterday's article, in which we clearly demonstrated that Salsa bands were a greater problem than Zombies, we got heckled. "Be it St Pauls ... or St Werburgh's." Maybe I've been taking the same stuff as your Monotonix videoist, but these two film clips look like the same place to me. That's OK. We celebrate dissent, though we do add your names and comments to a spreadsheet, just to make sure it stays within clearly defined limits -and that when you cross them we know how to find you. Just remember there's a monument at the top of St Michael's Hill to where protestant dissenters were burned alive in the time of Queen Mary I, and you'll know what we're thinking of when people start criticising us too much. Reviewing the videos, yes, our IT minions had mistakenly put up two videos of St Werburgh's and none of St Pauls. To compensate, as well as beating them soundly, we made them put up some St Pauls photos and videos. First, you can see how City Road -and hence our access to Rita's and Slix takeaways- is blocked by pedestrians who are completely ignoring any cross/don't cross signs. They should all be fined for this. Next, you can see how drum bands cause as much a congestion problem as salsa dancers. Again, a lack of respect for us, the motorist, shows. Finally, shocking footage of police horses riding the wrong way up a a one way street. Do they pay tax? Do they have insurance? Yet the pedestrians walk and the horseriders ride around our city as if it were made for them. One way we calibrate our postings against the rest of the motoring press-release agencies is to compare what they say with what we've been saying. Recently, the AA that's been complaining most about zombies, in their high publicity "ipod zombies are the enemy" press event, where they pointed out that zombies "can be lethal for pedestrians, cyclists and car drivers." Well, yes, there is a special zombie event in the city scheduled for this weekend -2.8 hours later. But: how often do you see zombies in the way? Where is the defensible data? All the AA have is the insurance claims from the subset of people who insure their car -and then the subset who insure with the AA- and those people are financially motivated to blame the pedestrians rather than saying they were distracted by the phone call they were making. Furthermore, what does the AA know about zombies? What kind of zombies? Are we talking 1973 US-shopping-mall class zombie, or a modern 28-days later or Evil Dead 2 class of Zombie? Different, the latter are much harder to kill and far more dangerous to us car drivers. They are harder to run over and they can jump in through your window and try and bite your neck out, at least according to the film's we've seen. We do like to consider ourselves Britain's premier data-driven traffic news site. We back up our claims with defensible data -photos and videos-, and we like to tie it in to current scientific thinking. Which is where we have to criticise the AA. We have yet to see any Zombies in our streets. All we have is a truck parked in the showcase bus route on Gloucester Road one morning with an advert for Virgin Trains on it "Don't Go Zombie" -yet it implies that the zombie are in the cars, on the M5, not stuck somewhere near Sheffield on the one daily Virgin XC train to Scotland, or roaming our streets endangering car drivers. We also have the scientific research behind zombies, behind their decision making. The AA: not a thing, just some comments about insurance claims. This misses out on this seminal presentation on Zombie walking/climbing algorithms, how zombies can choose to attack on trajectories which are hard for us, the humans, to predict, yet which are fairly easy for subhuman intelligences to come up with. This is the best ever paper on Zombie routing algorithms ever written, yet the AA doesn't even bother to cite it or discuss its implication for vehicle-assisted-driving technologies. This makes us suspect that the AA and its "independent" traffic science group are just making things up to suit their prejudices. That's two videos of Samba bands blocking our streets. None of Zombies. And a citation of the best ever paper on Zombie routing to date. When will the AA notice this growing problem and issue a press release denouncing Samba bands? Months after us, we expect. And even then, it will not be from in-the-field monitoring of near-miss incidents, but purely by people claiming for damaged caused to their cars by uninsured samba bands. You've got to hand it to our city's authorities when promoting the city's tourist jewels! With visitors piling into the city recently for the marathon, it was important to showcase some of the city's treasures. Rather than waste time by having runners' families meandering on foot around College Green, the delightful Norman gate house and College Square behind, we managed to close College Square, turn it into a car park and have our visitors like CK03VPN actually DRIVE THROUGH the 12th. century monument in their cars. How imaginative is that?? And just in case you think these intrepid drivers might have been breaking the law - No! Thanks to the Fluorescent Jacket (Hazard Flasher Amendment) Act: 2005, all we need to do is station someone in a green jacket and lo! it's legal. One nice detail for those of you not enamoured with the Lycra louts - the authorities built some temporary tarmac dropped kerbs for cars like CE05VAV to mount the pavement. These, you will be pleased to hear, were removed again immediately after the weekend so as to deter the cyclists from using this very tempting car-free route from Park Street to Harbourside. Over the bicycle blogs, there's a lot of anti-taxi rhetoric. Well, that probably goes back centuries, since the first important people -our ancestors- rode horses and so differentiated themselves from you, the little people. But if you spend time talking to anyone who worked as a taxi driver, you realise life is hard. One of their big fears is will the passengers do a runner, and if they do, will they just run or try and rob you in the process. Nobody likes picking up passengers to some parts of the city at night. It's the Bristol equivalent of London's "I aint goin souf of the river". Except for one company. Yellow Cab of Bedminster aren't scared of South Bristol; they will take you wherever they want to go. Even better they will pick you up from where you want to be picked up from. And on a Saturday, that means Bedminster. Here DN05KFD is awaiting any passengers on the corner of Boot Lane and East Street. For those people who can't cross the Boot Lane, their colleague in BD53MYX will pick you up. 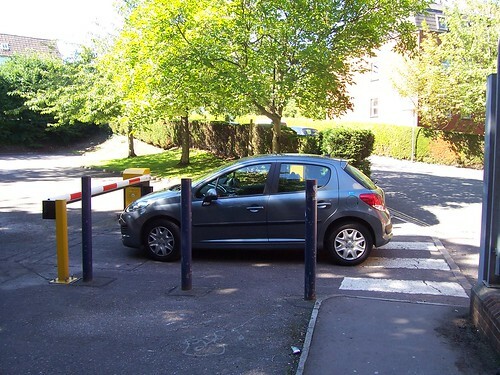 Now, some people worry who is not capable of crossing the road, but Boot Lane is the home to the local RNIB branch, whose issues with Pavement Cycling have been covered by both us and the Evening Post before. Down Boot Lane itself, KR08YJK not only helps keep the pavements clear of bicycles, they ensure that those people whose eyesight problems prevent them from driving their own cars, will be able to enjoy the convenience of having their own vehicle on the pavement just where they need it. (One of the taxi people was a bit upset about the cars being photographed, but to respect their privacy we didn't include photos of them. We would encourage others to keep an eye on this area to see that Yellow Cabs are providing taxis for shoppers and visitors to the RNIB offices on a regular basis, so they get more used to such activities). We like to track that we are on message by the mail and comments we get back: if people aren't upset by the truths, well, we aren't writing the right truths. Our Portsmouth Seafront Update upset someone, so it must have been good. We criticised someone for cycling down the (admittedly wide) seafront, arguing that their actions were not only endangering themselves, their child and pedestrians, but the entire Southsea seafront economy. "There are a few cheap stalls and a run down arcade along the front...so how much do you think the economy of Southsea is really affected? Of course the real sensible solution is (like many other seaside towns in the UK) to paint a cycle lane along the promenade. It has ample width. We must try harder to get people out of their cars and (safe) walking or cycling." Well we looked back through our photographs, dataset, as we like to call them, and concluded that yes, the arcade is a bit run down, as is the funfair at the end of the pier. The photographs hide the 20mph wind which made the crazy-golf a bit more problematic than usual, but you get the general flavour. Room for improvement. Similarly, the clubs along the seafront do appear to have seen better days. All that was up and running over the bank holiday was the Southsea Folk and Roots Festival, and even there the bar on the South Pier let the side down by running out of all beers -even Fosters- by Sunday evening. However, note that these photographs were taken on the same day we saw the man and his child cycling down the seafront. There is no way to disprove our claim that the cause of the problems is in fact the intermittent cyclists and their families on the sea front, scaring off people from the arcade or the night clubs. Byron! We thank you for your feedback but we refudiate it! We reported, last Saturday, on the Anarchist Book Fair in Stokes Croft. Anarchism. It has to stop. Our Monty week has gone on a bit, but that is because there are always shocking things to cover. Last month, we were celebrating the loss of a bollard finally re-opened Picton Square to important people in their 4x4s, giving you somewhere in this narrow-laned part of the city to park where you could be confident that your mirrors and paintwork would be safe. But look at how this selfish cyclist endangers the paintwork of the parked 4x4 P334OWP. By trying to scrape between the remaining bollard and the vehicle, her child wagon may brush against the vehicle and so cause damage. And would any cyclist -who is no doubt uninsured- stop and leave their contact details were this to happen? We doubt it! Note also that we have evidence this helmet-less mother lets her children play in the street! We have informed Bristol Social Services. A car on a corner, nothing unusual there. Room for a pedestrian to get past. But for some reason, today, LK54RZA sports a ticket. Why are the police cracking down on the historical rights of Montpelier citizens to park wherever they can? Clearly motorists are more important and must take priority on the road, regardless of the right of way of inferior pedestrians or cyclists. It is concerning to us then that so many of these "alternative" travel modes seem to think that they can be considered as a legitimate form of transport. Consider this next case. Imagine you are almost 30 seconds away from your destination and you want to turn right into Stanton road from PenPark road, Southmead after a long morning doing something important. A cyclist decides to turn in front of you, thinking that they have right of way as another car might have in his same situation. It will not do at all and is likely to add several seconds to your journey. It is important to make a point about this impudence! P198HWK takes such action and attempts to force cyclist onto the pavement where he would normally belong. Disappearing around the corner there is an inspired one finger salute just in case there was any doubt by the cyclist that he had done something wrong. The trouble is that we cannot condone this sort of action. Imagine the engine and tyre wear that vehicles would suffer from this revving and squealing and if this was the norm then it will only add to the large expense that us poor motorists already suffer. Let's hope at least that this one cyclist has learned his lesson. "I overheard some dangerous anarchists last night discussing dropping stuff off at their annual bookfair on Stokescroft. And their plan? To stop and unload outside the venue on the cycle lane!" We checked, and yes, the Bristol Anarchist Bookfair is on September 11 at Hamilton House, home to reasonable beer and some subversive cyclists. However, if you are starting a revolution, parking on a bike lane in Stokes Croft is hardly an auspicious way to do it. Look, earlier in the week, our famous YA55VDY is out there, unloading stuff on a bike lane. Everyone does it. It's the only free parking in the area. It's not exactly a Battleship Potemkin or seizing of the Bastille class event. Come on subversives, try harder! Our Friday quiz this week is what is wrong with this photo of two fixie bikes down in Cabot Circus. For the bank holiday w/end we checked out the anti-bicycle improvements in Portsmouth. We couldn't be bothered to drive our van to where the new segregated bike path is, so we stood by the Southsea Pier to watch two cyclists who have come from it experience the joy of a FirstBus bus turning over them. They survived to carry on the short distance before they have to swerve out past the parked cars to then get in our way. For those people who aren't in the loop, the Portsmouth Council has pulled in plans to expend the bike path all the way west "for review" after complaints about the first stretch. This means there is nowhere safe for cyclists in this part of the town. Well, some people may make the case for the sea front itself, but you can see on a bank holiday weekend that this is over-busy. The valuable revenue streams of the telescope and southsea pier fairground are dependent on passing traffic. These people walking down here -presumably people who drove here first- hold together the local economy. Reducing parking or making walking more hazardous would destroy it. He is threatening the entire economy of the Portsmouth/Southsea seafront. All those anti-car activists don't appreciate how good the sunset looks on the M4 westbound on a bank holiday weekend. Today, Sept 7, is the next council meeting, where some protesters will be campaigning to protect the parkland of the city, such as here, the fields by Lockleaze, from progress. The green party, are obviously against it. Question is, what should the B.Traffic stance be? To us, this green stuff is all wasted space which could be replaced by drive in superstores or more housing. But we fear something: the consequences -the congestion. Look at this "field" above. Soon it will be a playing field for Fairlawn School. Behind the trees, the hill drops down to Muller Road, a key bottleneck in this part of the city, and a road you can waste hours on of a weekday evening. There is no point redeveloping these forgotten parts of Lockleaze without adding a new dual carriageway to the M32! There. We said it. S106 infrastructure money needs to go into either uprating Muller road to a full dual carriageway -as we've advocated in the past- or adding a new route to the M32. Which is where an idea springs to mind. St John's Lane. From Purdown Camp down to Stapleton. Twenty years ago you could get car up it -admittedly, a stolen one you'd have to torch afterwards, but you really could drive all the way up it from Stapleton to Lockleaze. Not now. There's a gate in the way, relegating it to being nothing but a foot/bike path. But sometimes, the gate gets opened by the allotment people, and the dream comes back. A dream of a road, from here, the top of the city, right down to stapleton, and then, ideally, a new M32 on-ramp. Just a short one, like the Mina Road on ramp; enough to reward people with big-engined cars. And here, a place for the road to begin. Look someone is trying it already, with their Peugeot 306, X615EDB, seeing just how far down the footpath they can get. What better way to enjoy a summer evening than to drive down here and to dream of more dual carriageways. Trivia footnote: the fields above date from the civil war; some of the hedges are apparently historical monuments or something. Presumably St John's Lane has the same history and access rules, despite the gate and the no trespassing signs. Sept 10, 1645, was when Prince Rupert of the Rhine and hence Bristol surrendered to the people, at least in the form of Cromwell's New Model Army. So what will happen this week, 365 years on?